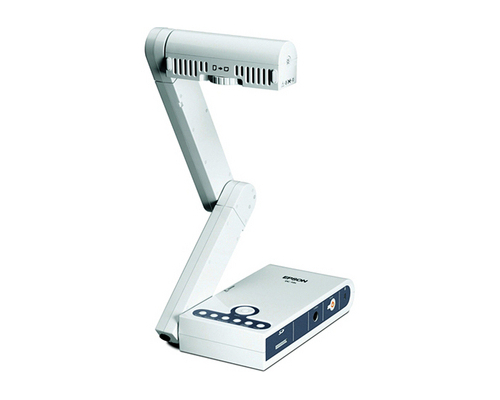 The Epson DC-10s is a full-color document camera designed to fulfill the same functions as and replace the camera component of the overhead projector, making it intended predominantly for classroom markets and other environments in which paper documents, undigitized, need to be presented on a regular basis. The camera measures 5.5" by 10.9" by 23.5" when extended and open and 6.6" by 10.9" by 1.7" when closed and folded IT weighs 5.5 lbs, making it considerably smaller and more portable than the product it's intended to succeed. The camera captures images at a resolution of 1600 by 1200 pixels using a 1/3" CMOS. It outputs SXGA analog RGB and S-video signals at a resolution of 1280 by 1024 and at a frame rate of 15 frames per second. Two LED lamps illuminate documents. The camera's lens has an F of 3.5 and an f setting of 6.7 mm. Its capture area is between 1.6" by 2" and 14" by 19", and it supports digital magnification up to 5x and an 8x manual zoom, producing a 40x combined zoom. Focus and iris settings are automatic. The camera has an analog RGB input via a 15-pin mini D-sub compatible with SD cards and an output terminal offering the same set of connectors, but also a 4-pin mini DIN connector for S-video. This allows the camera to project images either captured by the camera or input from another input source, such as a computer or other analog video-compatible device. However, it does not include support for HDMI or DVI and digital output will need to be downsampled either to VGA or S-Video to be shown. A VGA cable is included. The camera includes 128 MB of internal memory which can be used to capture between 200 and 300 images depending on size and content. While the internal memory cannot be expanded, connected an SD card to the camera's output effectively addresses this problem, as it will save to that instead. The camera includes a split-screen function that allows you to simultaneously display both a captured and a live image, making it easy to show before and after shots, two versions of the same document, and other situations in which one may need to compare two files. The camera allows for digital image rotation, digital image freeze, and white balancing when necessary. The camera also includes negative and positive converstion, slideshow options, one-touch image freezing, and an on-screen display menu. Unlike many other camera manufacturers, Epson offers a three year limited warranty for this camera, considerably longer than what's offered for most equipment. The DC-10 is essentially a single function camera, making it difficult to use in applications other than projection replacement. The DC-10 is also all-analog, making it a difficult purchase to recommend when so many systems are going almost all-digital. Interfacing the DC-10 between many newer systems will require downsampling digital images, requiring additional cabling and connectors in order to do so, a potential inconvenience. Unlike the overhead projector, the camera will need to be connected to an analog or digital (with its digital signal downsampled) projector to display an image upon a wall. The camera can be connected directly to a PC, but this essentially defeats the purpose, as a scanner would prove less expensive and produce documents at a considerably higher resolution. Given the camera's design, there are almost no opportunities for expansion and thus no accessories, as it is built to fulfill a single purpose with limited means by which one can improve upon, or change, its essential design. Projector stands and screens are available, but the camera does not support additional lenses, tripods, or anything of the sort. The camera isn't particularly portable, nor can it be powered without its AC adapter and 120VAC cable, and thus a case is largely unnecessary. The camera can, however, interface via its video-out options to other projectors and similar systems if necessary.